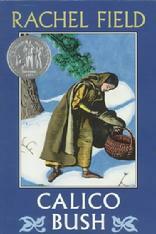 This week for the 52 Books in 52 Weeks challenge, I’ve been reading Calico Bush to Sophia as part of her fourth grade curriculum. Left orphaned and alone in a strange country, thirteen year old Marguerite Ledoux has no choice but to become a servant girl. She promises her services to the Sargent family for six long years in return for food and shelter. But life as a “bound out girl” is full of more hardship than Maggie ever could have imagined. Living with the family in an isolated part of northern Maine, Maggie struggles through the harsh, hungry winter of 1743, the constant threat of Indian attacks, and worst of all, the loneliness she suffers knowing that her own family is lost forever. Will the Sargent’s house ever feel like home? The book is a 1932 Newberry Honor book (a runner-up to the Newberry Medal). When the story opens, Marguerite is on a ship headed for frontier Maine with the English family she is in service too. One of the trials of her new role in life is that she is not called Marguerite, but “Maggie” by the family. The English in the colonies thought the French were usually poor, in part because France and England were at war, and in part because most French people were Catholic. Marguerite was fortunate a family was willing to take her, even if they were unwilling to address her by her French name. This tension is illustrated throughout the book by the constant referral to her in the text as Marguerite, although she’s addressed by others as “Maggie.” Thankfully, for Maggie’s sake, her main responsibility is the young children, who accept her for who she is, and don’t hold being French against her. The book takes place over the course of a year, starting with summer and ending with spring. At the end, Marguerite is not the same person she was at the beginning. The change takes place very believably over the course of that year. Her character is well-developed and realistic, and the other characters in the story are very interesting also and seem like real people. As a read aloud book, the language poses a bit of a challenge in that it isn’t “proper” English. That being said, when the characters “speak,” the reader can definitely hear what they sound like. The book took a bit of “getting into” before the action and story picked up. Once they arrived in Maine and began experiencing challenges, the book became much more interesting, and was one that we were eager to continue reading. Looking forward to a summer of fun with you!